Sitting in front of a crackling fire in the Vaynol Arms in Nant Peris, Snowdonia, may not sound like anything special. 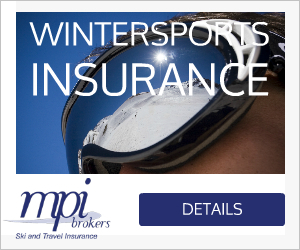 But how about being there for après ski, drinking a pint of ale with ski boots on? We had skied from the summit of Y Garn, and the snow cover was so good that we only had to step out of our bindings to open the gate and cross the road. There was an awkward silence. I had to confess it was really a case of how many days per decade; or perhaps we should consider hours rather than days as the ideal units for measuring the frequency of pow? 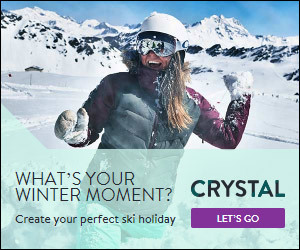 The truth is that we have skiing right across the UK. There are ski tows on the Pennines and in the Lakes; there’s awesome touring to be had all over the place, from Snowdonia to the Howgills. And I hear the grassy slopes of Mam Tor, in the Peak District, make for great freshies when the conditions fall right. A combination of southerly latitudes, low-lying hills and proximity to a warm-wet west coast gives a powder descent in England and Wales a certain je ne sais quoi in a triumph over the elements. But if you really want the best of what the UK can offer, you need three things: a vehicle to get you swiftly over the Scottish border; your skins and gear packed, ready to sling in said vehicle at a moment’s notice; and a mate in the know to give you the call (and the beta) when conditions come good. Skiing in Scotland is nothing new. People have been doing it since the sport began. A hotbed of talent for decades has been Glenmore Lodge, at the foot of Cairngorm Mountain near Aviemore, where the team has been knocking out impressive descents ever since the legends of Fred Harper, Iain Peter, Martin Burrows-Smith (‘MBS’) and Keith Geddes and set the bar in the 1980s. On the opposite coast, the Chamonix guide Jean Franck Charlet put Ben Nevis on the ski map by skiing Good Friday Climb in 1982, while MBS got the tick on all the main gully lines on this spectacular north face. At the end of that decade, the Aonach Mor ski lifts opened, north of Fort William, giving access to a huge number of lines in the back corries of Nevis Range and beyond. 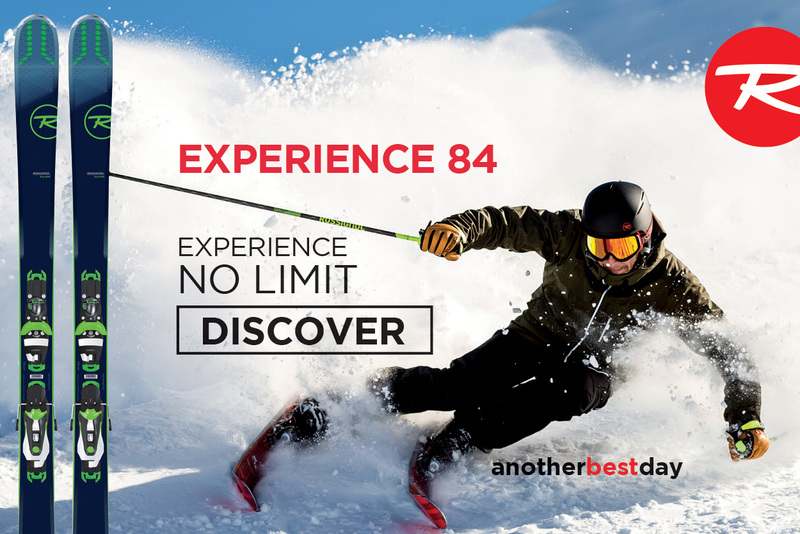 Today, a brace of new books makes it easier than ever to find world-class skiing in your backyard. 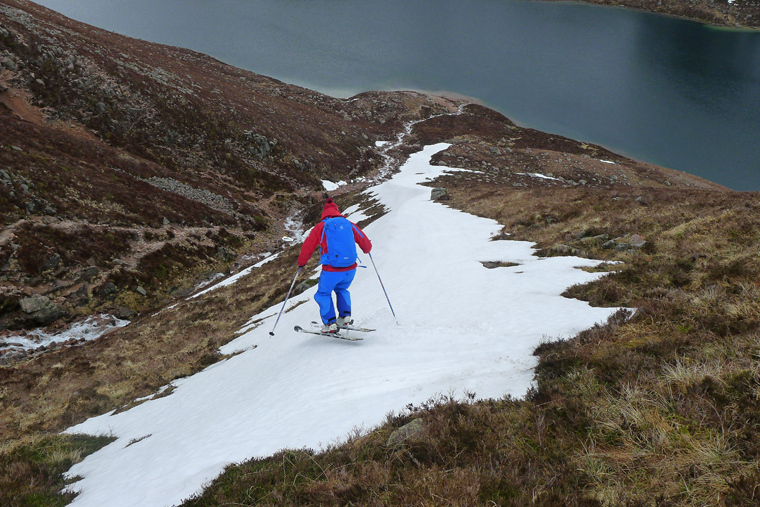 Scottish Offpiste Skiing & Snowboarding, written by Kenny Biggin, provides a potted history as well as bringing us bang up to date on developments. From forays on Ben Nevis in 1904 (when men were men and skis were ma-hoo-sive) through to early descents of classic terrain, the books – one on Glencoe, the other on Nevis Range – acknowledge it all. Any such project is a labour of love. But when you consider the conditions endured by Kenny and his team to check out this many descents, and take this many blue sky photos, you have to doff your lid in respect. Chapeau, Mr Biggin! Classic lines and hidden gems are expertly archived. Mouth-watering pictures tempt you, detailed topos lead the way and infographics give you the beta you need. The secret, he adds, is knowing where and when to go, and indeed he spells this out. So what are the picks of his crop? 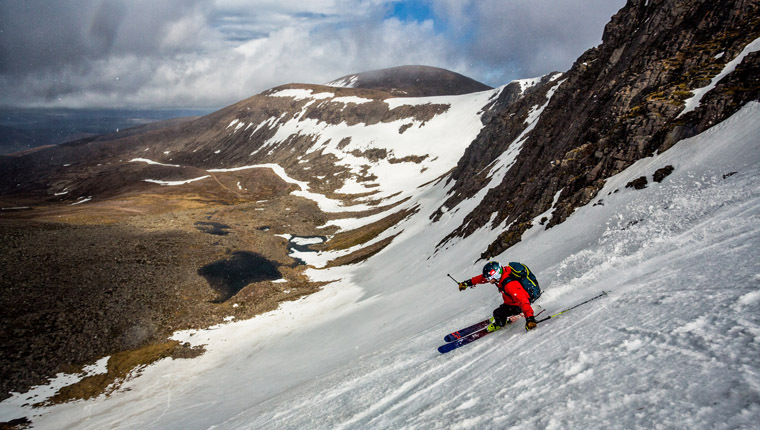 Kenny started skiing ‘over the back’ at Nevis Range in the early 1990s, and this area holds a special appeal for him. 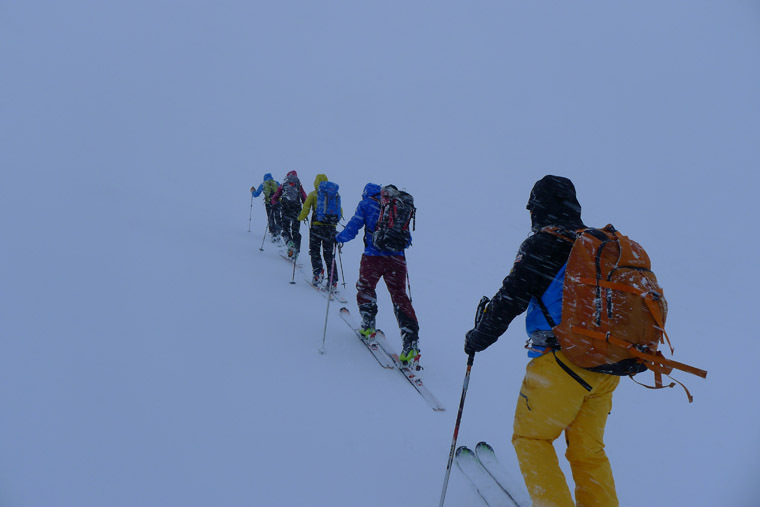 Today the Glenmore guides of Cairngorm – who run a programme of trips and courses in Europe as well as in Scotland – are no less keen than the original bunch. In fact, British Mountain Guide Andy Townsend had just earned his badge when he moved his family to Scotland. Andy: are you mad? Well, yes – because when I asked him, “Why Scotland?” he started going on about pizza. “Scotland is the ‘ultimate pizza restaurant at the end of the universe’,” he told me. “I apologise for this Douglas Adams-inspired reference but I can think of no better way to describe why I love skiing here. A circuit of the Northern Corries is a great beginning to your love affair with east coast skiing, with the lifts to help you out. 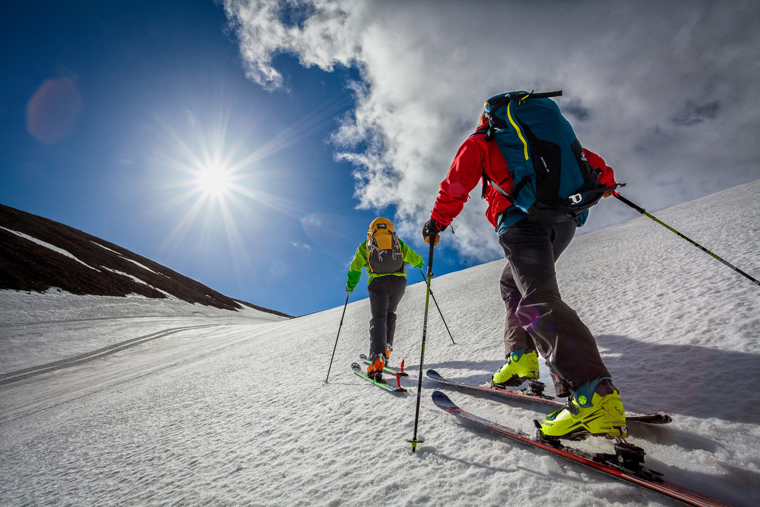 Grab a touring pass from Cairngorm base station (two uplifts for £10), ride the Ridge and M1 poma to the Ptarmigan lift station and neck a hot chocolate before skinning or booting to the summit of Cairngorm. Descend first south then south west into Coire Raibert. A gentle skin along the northern edge of the Loch Avon basin (pronounced Arrrrn) will lead into Coire Domhain, a good spot for lunch before the final skin onto the summit of Coire Lochan. There’s a gentle descent west before you turn north west down to the top of Lurchers gully, possibly the most reliable and skied patch of snow in Scotland. This must-do classic takes in the four tops: Cairngorm, Ben Macdui, Carn Toul and Braeriach. Again, I use the lifts to get a headstart up to Cairngorm, then head to Coire Domhain. Undulating terrain leads to the summit of Ben Macdui, Scotland’s second highest summit. Then I head south and pick up the top of Taillears Burn, a perfectly angled awesome descent that’s nearly always full to the brim with snow. The subsequent climb up to Cairn Toul via the Devil’s Point is a slog, but on the plateau you zip quickly to Braeriach. This would be the perfect place for lifts but the road went to Cairngorm so they built them there. Braeriach has open slopes, steep bowls, couloirs that would make a Chamonix guide sweat: the choice is yours. A calzone is for the seriously hungry, just like the gullies of the Cairngorms. Nowhere else can you ski so many great lines with such little effort. At Coire Sneachda, Jacob’s Ladder and Aladdin’s Couloir are classics; while ‘the couloir’ in Lochan is a steep treat. If you’d rather not slalom between the climbers who take up residence in these corries, then head to Loch Avon: Diagonal and Y Gully can be linked together before lunch, or combined with more famous lines in Sneachda. Further afield, March Burn is my favourite way into Larig Ghru. In spring, when there’s corn snow, Braeriach is best: a scan with binoculars from the roundabout next to the, umm, pizzeria at the southern end of Aviemore will tell you what the cover is like. I ride my bike up Glen Einich, leave it in the heather and skin up the Escalator, a ribbon of snow from the plateau to the glen. From the summit, make laps of the northern slopes and coires. 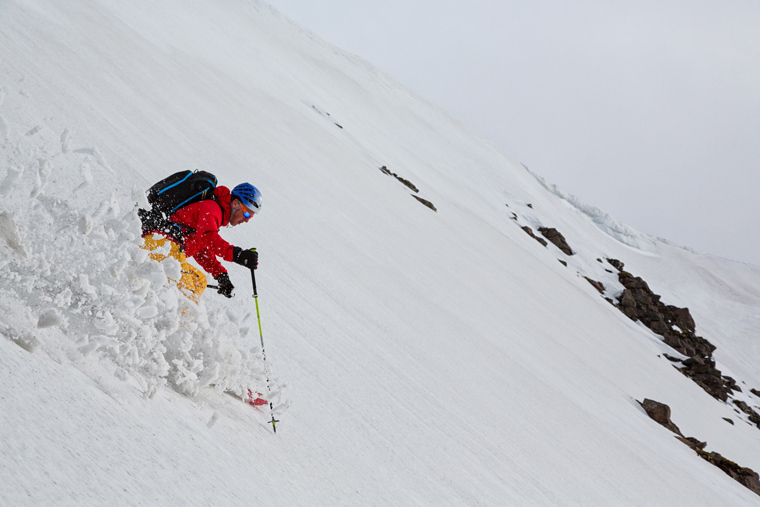 Sneachda has steeps, gullies and tributaries. Easy to access, it’s a great place to warm up before heading over the back. 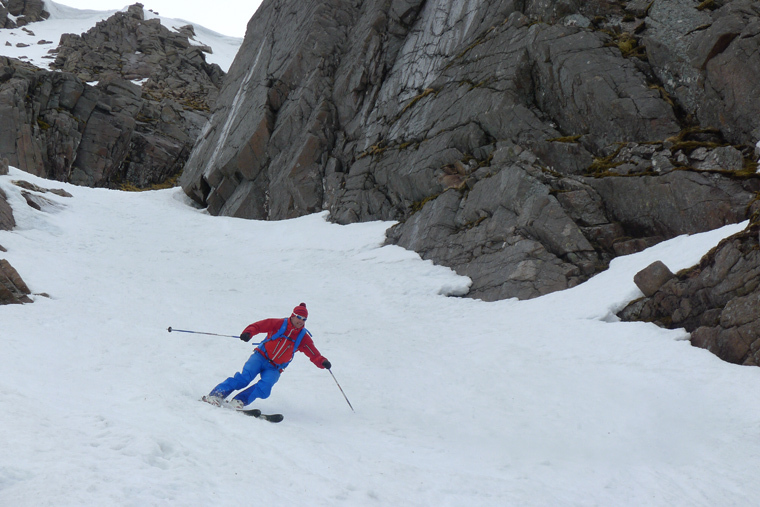 Castlegates and Pinnacle Gully, off Shelterstone crag, can be approached with a pleasant ski down Coire Domhain. These gullies can be accessed from the top, but I boot up to check conditions as these shady devils sometimes transform into ice rather than spring snow. 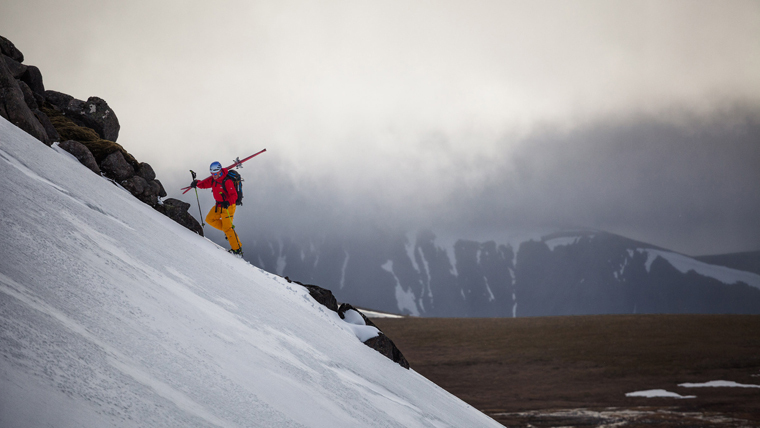 For more remote spice, head to the numerous lines in the Coires of Braeriach, with their huge cornices and steep run-outs. Why are Cairngorm gullies so good? It’s down to wind; lots of it! The plateau acts like an aeroplane wing, accelerating the wind speed to hurricane proportions. As the wind blows, the snow gets stripped and packed hard into the gullies, filling them up. Sometimes the plateau has only a few inches while the gullies are buried under metres, which is great for us! It seems right to wrap things up with the wise words of Martin Burrows-Smith. British Mountain Guides have recently published a book entitled A Passion for Mountains. You might expect MBS to write about his new home in the Alps, or some of the far-flung places in the world his career has taken him. Intead, MBS does a great job of answering our killer question in the aptly titled chapter So why ski and why Scotland? “Today, from a comfortable base in Switzerland, I can on any day be climbing or skiing in any of three countries in a huge variety of areas and altitudes. But – and it’s a biggish but – it’s all too easy. There are often far too many other folk out touring here in the Alps. It is becoming increasingly difficult to find peace, quiet and virgin snow.